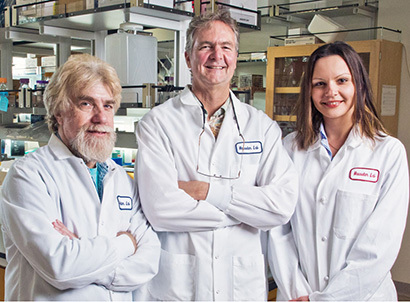 Ted Goldstein, David Haussler, and Olena Morozova (left to right) are involved in the California Kids Cancer Comparison, a project of the Treehouse Childhood Cancer Initiative at the UC Santa Cruz Genomics Institute. The California Initiative to Advance Precision Medicine has awarded a $500,000 grant to the UC Santa Cruz Genomics Institute to support the Treehouse Childhood Cancer Initiative. The award supplements previous funding for the Treehouse Initiative’s work on the California Kids Cancer Comparison (CKCC) project and focuses on a collaboration with Stanford University and Lucile Packard Children’s Hospital. The Treehouse Childhood Cancer Initiative is the pediatric cancer research arm of the Genomics Institute and was founded by the institute's scientific director, David Haussler, and postdoctoral researcher Olena Morozova. State funding for this work is supplemented by additional funding from St. Baldrick’s Foundation, Unravel Pediatric Cancer, and local philanthropists Rafe and George Kraw, among others. With funding for the next stage, called CKCC2, the Treehouse team will conduct a 24-month registry study in collaboration with oncologists at Lucile Packard Children’s Hospital and Stanford Medical Center. This type of study collects and analyzes genomic data from a child’s cancer tumor and presents the information to the treating clinical oncologist teams. CKCC2 will evaluate the effectiveness of comparative RNA-seq analysis within the clinical process, including tracking patient outcomes and assessing the impact on clinical decision-making and the patient's and family's understanding of and engagement with genomic analysis. In line with Treehouse’s commitment to providing open access to data, all software the initiative uses is open source. This means that all RNA-seq processed data and accompanying analysis will be made publicly available to benefit researchers. The hope is that by maintaining open access, the Treehouse Initiative can help advance the state of pediatric cancer research. While Treehouse researchers want to know whether molecular-level tumor activity they identify in the lab drives tumor growth, the team is ultimately concerned with whether genomic analysis could provide a measurable benefit to patients. The project aims to measure “clinical benefit” not only in terms of tumor response and symptom control, but also in terms of how patients, their families, and their physicians respond to this tool and use it in their decision-making. Information regarding acceptance of the genomic analysis will be useful in improving education and training during widespread use of genomic-based precision medicine. “At the end of the CKCC2 project, we will have a greater ability to evaluate whether Treehouse’s approach to precision medicine added value to the journey of the patients, their families, and physicians,” said Haussler.